Night sweats are sometimes perceived as a problem that only affects women due to their association with menopause. However, a study published in the Annals of Family Medicine shows that men also experience an increased risk of night sweats and hot flashes as they age. 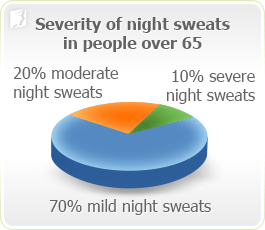 In order to study night sweats in elderly patients, the medical researchers interviewed 2,767 patients, 41% of whom had night sweats within the past month. Of those patients, 23% reported night sweats alone, while 18% suffered from daytime as well as nighttime sweating. Night sweats affect both men and women the most between the ages of 41 and 55. They may continue to affect around 30% of men and women over 60. They are associated with other bodily pain, such as muscle, bone, and joint pains, as well as headaches and stomach pain. Although both men and women suffered from their most intense and frequent symptoms from the ages of 41 - 55, this report focused on older people in order to isolate the effects of night sweats themselves from the effects of menopause and its associated symptoms. Night sweats during menopause are usually caused by estrogen deficiency, but because both older men and postmenopausal women experience them, estrogen deficiency is unlikely to be the cause as people age. During this study, 30% of patients over the age of 65 reported night sweats.night sweats worsen with age in men and women. The investigators asked the participants about the frequency and strength of their night sweats, as well as to what degree the patients found them troublesome. Out of them, 10.3% of the patients answered that they were noticeably disturbed by night sweats, while 70% described night sweats as only mildly troublesome, and 20% rated their night sweats as moderate. Night sweats were also associated with body pains: 97% of patients reported night sweats also suffered from body pain (in the muscles, joints, or bones), while 68% noted pain in the stomach or chest. Fever, muscle cramps, and tingling were also associated with night sweats, perhaps due to dehydration and electrolyte loss. Anxiety and nervousness were also observed in patients suffering from night sweats. Although the precise causes have yet to be explained, the research team concluded that there is an increased risk of night sweats in men and women who are 60 and older. Mold, J.W. et al. (2004). Prevalence and Predictors of Night Sweats, Day Sweats, and Hot Flashes in Older Primary Care Patients: An OKPRN Study. Annals of Family Medicine, 2(5), 391-397.